This is the first test of Astrodon’s new Near-Infrared (NIR) tri-color imaging filters. This image is analogous to a visible LRGB image except the L is a NIR long-pass filter letting all NIR light pass to the CCD and blocking all UV and Visible light. The 3 "color" filters correspond to 700-800 nm (NIR1), 800-900 nm (NIR2) and >880 nm (NIR3). These filters were designed to have similar flux with Kodak E-Series CCD detectors for a G2V white-point. The color combine weights for a G2V white point are 0.85:1.00:1.21. NIR1, NIR2, and NIR3 are mapped to B, G, R in order of increasing wavelength. Marshall L. McCall (York) and Ronald J. Buta (Alabama) got more than they bargained for when they trained the Burrell Schmidt Telescope on Maffei 1, a famous heavily-obscured galaxy once thought to be a member of the Local Group. Their plan was to use deep 0.8 mm CCD images to gauge the size and luminosity of Maffei 1, which in turn would yield a better estimate of its distance. 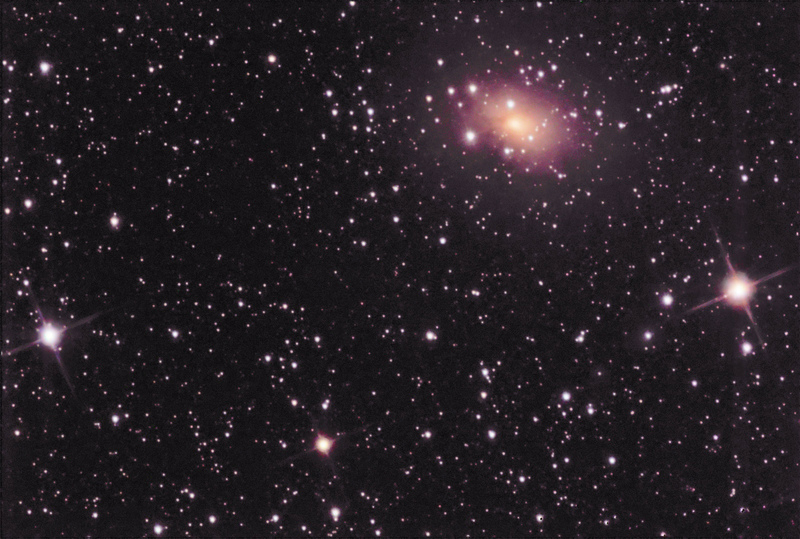 But it wasn’t Maffei 1 that got McCall and Buta’s attention, but two previously unknown nearby galaxies that were captured by their wide-field images. These two new galaxies may be within the physical neighborhood of Maffei 1, but in any case are most likely to be no more than 3 Mpc away. Maffei 1 may be the nearest giant elliptical galaxy to the Milky Way. Present measurements place it only 2 to 4 Mpc away. Maffei 1, however, has a galactic latitude of only -0.6d, and is so heavily obscured (5 magnitudes in V) that it wasn’t even discovered until 1968 (by Paolo Maffei of the Laboratorio di Astrofisica). We now know that there is a group of 13 galaxies in the same general area of the sky, dominated by Maffei 1 and the giant spiral IC 342. Understanding the role of Maffei 1 in the dynamics of the Local Group is of particular interest. M31 is located in the same general direction as Maffei 1 and is thus even closer to it. With Maffei 1 moving away from the Milky Way at 145 km/s, and Andromeda moving towards us at 121 km/s, it’s possible that M31 and Maffei 1 had a close encounter about 7 billion years ago (assuming a distance to Maffei 1 of 3 Mpc). Dependent on the mass of Maffei 1 and its companions, a past encounter with Andromeda could have been interesting and might have repercussions for understanding the interaction of M31 with the Milky Way. The path to deducing the mass of Maffei 1 begins with obtaining accurate measures of its magnitude and diameter. Good photometry is key to determining its luminosity and distance via the fundamental plane of elliptical galaxies. The Burrell Schmidt is ideally suited to this task. Early work byMcCall and Buta suggested that if Maffei 1 were unobscurred, it might be as big as 15′ in diameter and have an apparent visual magnitude of about 6, making it one of the biggest and brightest galaxies in the northern sky (only M31 and M33 would be brighter). These results led them to seek an instrument capable of observing very low surface brightness levels over a very wide field. The Burrell Schmidt equipped with a Tektronix 2048 X 2048 CCD provides a 70′ X 70′ field of view. This is big enough to image either Maffei 1 or IC 342 with lots of surrounding sky. When McCall and Buta acquired their first 10-minute exposure of Maffei 1 in the I-band, they were delighted to find Maffei 1 covering 14′ of sky. They also noticed a fuzzy blob about 20′ to the southwest, which they strongly suspected was another galaxy, although at first glance a reflection nebula might alsoproduce such a feature. Full reduction of the images, which involved removal of the copious foreground stars, was required before a definitive answer could be obtained. Indeed, it was during this process that they discovered a second galaxy candidate. Both galaxy candidates were extremely red. Furthermore, after processing, the first candidate was revealed to be a barred spiral, perhaps as big as 6′ in diameter, which at a distance of 3 Mpc would make it about 15% of the size of the Milky Way. The second galaxy candidate proved to be a dwarf irregular.After McCall and Buta submitted their results, Walter Huchtmeier (Max-Planck Inst.) searched for neutral hydrogen emission from the galaxies,using the 100-m Effelsberg telescope in Bonn. The spiral was detected at a heliocentric velocity of 189 km/s. Although this velocity is somewhat high with respect to Maffei 1, it supports membership in the Maffei group. Surprisingly, the 21 cm flux was a factor of at least 3 lower than what it should have been given the visible area of the galaxy. The velocity and HI deficiency suggest that it is interacting with Maffei 1. Unfortunately, the dwarf irregular was not detected. However, the motions of galaxies in the Maffei group overlap those of neutral hydrogen in the Milky Way. If the irregular were moving at around the same velocity as Maffei 1, or slower, it would be overwhelmed by emission from the Milky Way. Thanks. Only for a couple of months. Never had that capability before.